If an AirBNB “host” needs to give a refund because the accommodation was terrible, they can block the bad review by cancelling instead of refunding. It does mean a 100% refund, but that is clearly preferable to bad reviews and AirBNB have confirmed that this is deliberate. Some people have pointed out that the same thing is possible on sites like eBay – but I think holiday accommodation is different. You cannot return the product for a full refund, and the precious days of your holiday are gone forever. The way I found out was, of course, a booking that went really badly. We needed three rooms (me,, my wife, our two daughters and a friend) in Nuwara Eliya, in Sri Lanka’s mountains, so we thought booking a house rather than our usual place made sense, so I used AirBNB for the first time. I found a lovely looking bungalow that had everything we wanted. The first problem cropped up even before we got there. Even though the listing says breakfast is provided, the manager asked us to buy things for breakfast. The listing said that a cook was available, and that was one of our main criteria in choosing accommodation as we had a lot to pack into three days we would be there. As we were taking our bags in we asked the caretaker about the cook, and he told us there was no cook, but he could cook breakfast (more on that later!). The listing still says the accommodation is provided on a bead and breakfast basis, and that a cook is available. Then we found that the place was filthy: the bathrooms had not been cleaned, there was litter under beds and cigarette butts in a laundry basket..We ate an Indian takeaway and thought we would get a good nights sleep and sort it all out in the morning. We then got the next little surprise which was a rat scuttling across the floor. Needless to say it scared the kids. I slammed a room door shut to prevent it getting into a bedroom, and we put the kids in their room with instructions not to open the door until we had chased the rat out of the house. We could not find it so we decided to go to sleep anyway. We phoned the manager , and he promised that both he and the owner (the latter is the “host” in the AirBNB system) would come there at 9am the following morning and sort out the problems. 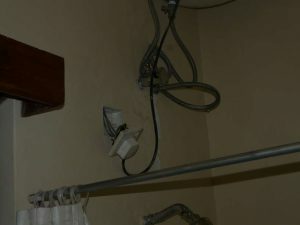 Yes, this is a socket hanging out of the wall, in the bathroom, right above the shower head. I had thought the floor level electric bar heater in the bedroom, crammed between the bed and the floor length curtains was a hazard, but this was even worse. That said, it was the heater that nearly started a fire because my wife pushed cushion (one of those neck support ones) off the bed so that it fell right next to it. Come next morning, the caretakers ability to cook did not stretch as far as frying eggs, and as we wanted fried eggs we cooked them ourselves. We made sure we were ready at 9am, but an hour later neither the manager or Somerset (who gets named after a county? ), the owner of the property, had turned up, and neither was answering phone calls. We would have been rather stuck at this point, but while I sent messages through AirBNB, my wife managed to work out that the manager and the host were both employees of the near by Hill Club. This is a beautiful private club founded by British planters in the 19th century. One clue was that we discovered that the laundry was done there, so we had immaculately clean sheets and towels in contrast to the rest of the place. So, when no one turned up at the house, we turned up at the hill club and asked for the two of them. After much prevaricating, and claims by the girl at reception that she could not find them, the manager turned up. In the meantime a little audience of staff were watching discreetly as we hung around. It possibly helped that we bumped into a member my wife knew. We were then promised that Someset was on his way to the house so we returned to wait for him. I rather suspect he was at the club at left after us, as both of them turned up together by car. In the meantime I read the reply on AirBnB. Somerset simply refused to believe our complaints, saying the rat and the dirt were “not possible”, and claiming that the listing had been “rectified long ago” with regard to the cook and bed and breakfast (see the screenshot above) and ending “IT IS OBVIOUS THAT YOU ARE WANTING TO CUT SHORT YOUR STAY IN NUWARA ELIYA AND HENCE ARE CREATING THESE ISSUES“. He got out of the car, and his first words were to tell us that we had no business looking for him at the club. I suspect it would have been embarrassing for him if we did, but I will skip the reason why as it would be unnecessarily vindictive to way any more publicly. While all this was happening I had contacted AirBNB, send them photographs of the problems (not the missing cook or breakfast – it is hard to photograph an absence of cook). I did find them very helpful at this point..
Having got the refund agreed, and the evidence gathered in case he failed to deliver it, we booked ourselves into the nearby Gold Club to which I belong for the rest of the stay in Nuwara Eliya. Somerset calmed down a bit before we left and his tone was rather more conciliatory, though far from apologetic. The fact of the matter is that because this reservation was cancelled by your host neither of you should be able to leave a review and the system has reverted to that. It is not an error, it is the normal functioning of our system. With regards to your point about hosts being incentivised to cancel instead of having reviews on their profile, there isn’t actually an incentive to do that as when a host cancels they receive an automated review saying that the cancellation was made and they also fully refund the guest and may incur financial penalties for cancelling as well as other account related penalties. I am not convinced. The fact is that there is a mechanism that allows hosts to avoid the very worst reviews, and the financial penalties are limited if they are refunding all or most of the cost of the booking. Regardless of that, the end result is that the reviews are biased because hosts do cancel and thereby replace what would have been the very worst reviews with bland cancellation notices (and I cannot even see that in this case). In spite of this, I received another reminder to leave a review from AirBNB – containing a review link that is redirected to a message telling me I cannot “edit this review”.